With reference to your application for admission into B.Ed. (ODL) programme for the batch 2018-20, we wish to inform you that you are provisionally selected for the Counselling for Admission. You are required to attend the Admission Counselling at your own expenses on 00-00-2018 at 9 a.m. sharp in the Auditorium, Academic Building of the Dr. B.R. Ambedkar Open University, Jubilee Hills, Hyderabad. University called candidates in the ratio of 1:3 for Admission Counselling. So, it may be noted that this call letter for Admission Counselling may not automatically entitle you for a seat in the Programme. The admission is subject to availability of the seat at a programme centre. The candidate should satisfy the eligibility criteria laid down in the notification and prospectus. The admissions are subject to the rules of the Government, NCTE and the University. As per NCTE-2014 Regulations, apart from the general qualification and conditions candidate must be a Trained in-service Teacher in Elementary Education (Candidate should have passed TTC/DEd/DElEd/BElEd/LPT/DPEd/BPEd) [or] A candidate who has completed NCTE recognized Teacher Education Programme (TTC/DEd/DElEd/BElEd/LPT/DPEd/BPEd) through FACE-TO-FACE mode are only eligible for admission into B.Ed. (ODL) Programme. Without any of the above eligibility criteria/qualification your candidature will not be considered for admission Counselling. A set of Xerox copies of the above certificates (i.e. Sl. No. 1 to 13) and Four Recent Passport size Colour Photographs need to be submitted at the of Admission. Note: Candidate has to bring A Demand Draft drawn on any Nationalized Bank for Rs.25, 000/- (Rupees twenty five thousand only) in favour of The Registrar, Dr. B.R. 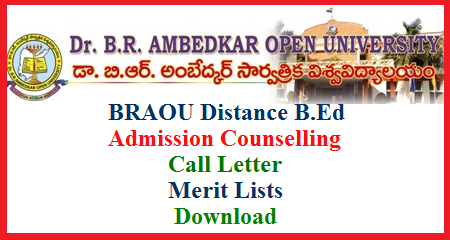 Ambedkar Open University, Hyderabad for admission counselling. SBI Branch is available on the University Campus. If, it is found that the admission is done on false grounds or suppression of facts, the admission will be cancelled at any time during the course and the candidate is liable for criminal prosecution. If selected, the Programme centre will be allotted, giving due consideration to the choice of the candidate as far as possible and availability of seats.